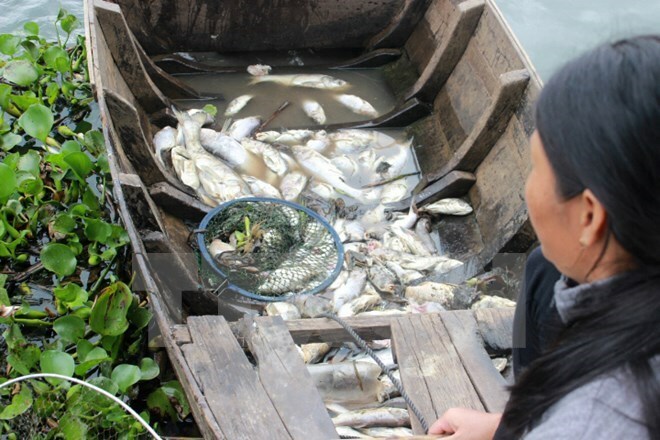 Hanoi (VNA) – The Ministry of Natural Resources and Environment (MoNRE) has asked its affiliates to intensify efforts to find the cause of mass fish death in the central provinces. Tran Hong Ha, Minister of MoNRE, asked relevant agencies to focus on economic activities that discharge waste into sea, particularly in the Vung Ang area in Ha Tinh province. He also instructed establishing stations to frequently monitor the quality of wastewater and waste from factories and ensure easy access to factories’ discharge of waste for frequent supervision. The ministry will take a tough stance on any organisations and individuals who cause environmental pollution, strictly fine violations, suspend operations of violators and force them to overcome the consequences. Persistent violators could even be prosecuted. The state management agencies and enterprises must ensure figures from monitoring wastewater and waste treatment plants are transparent, allowing local government, fisheries associations and local people to exercise their supervision. The ministry said it would form an inter-sector inspection team as well as invite local and foreign scientists to make independent assessment on enterprises who discharge waste into sea and scientifically examine all waste outlets. The team will begin its activities on May 5 and results will be reported to state management agencies, the mass media and the public.